European stock markets and the pound slid Monday after British Prime Minister Theresa May said she was delaying a parliamentary vote on her deal to leave the EU after conceding it would not win sufficient support. Traders took fright after May's move added to an unappetizing menu of high risks to the global economy, including the China-US trade row, signs of weakness in the Chinese and US economies, volatile oil prices. Art Hogan, chief market strategist at B. Riley FBR, said Brexit added to uncertainty over Europe, along with large street protests in Paris and an ongoing clash between Rome and Brussels over Italian budget plans. "Together they create a picture that doesn't spell a lot of good news for global growth," Hogan said. Bourses in Paris, London and Frankfurt all fell, along with markets in Tokyo, Hong Kong and Shanghai. Wall Street was also solidly lower early in the session before a turnaround led by the technology shares pushed US stocks back into positive territory. 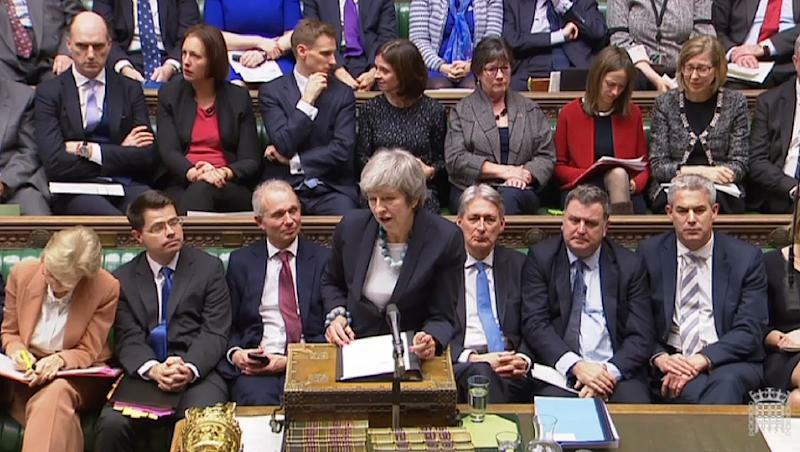 Britain was already digesting official data showing sluggish growth in October on a stalling car sector before May told parliament she would defer a vote scheduled for Tuesday evening, acknowledging it would be defeated. "Political uncertainly continues to gnaw away at the nerves of investors pushing the pound to just above the $1.25 level," said Rabobank analyst Jane Foley. 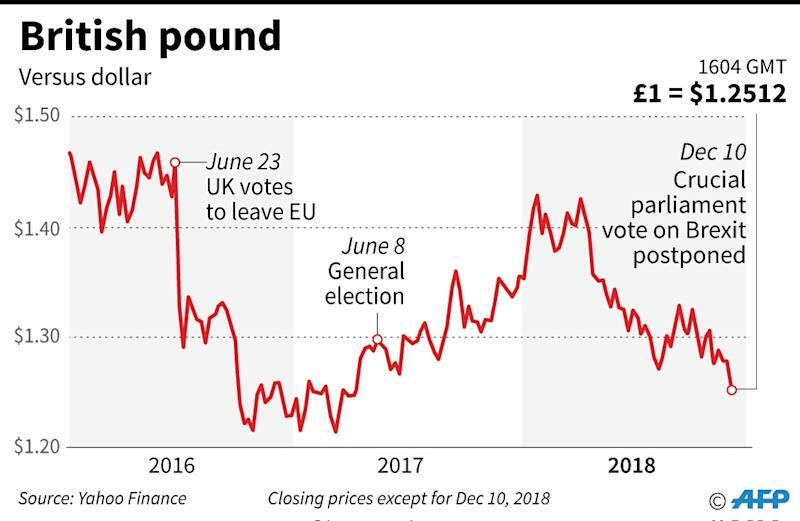 "Anxiety may have been triggered by Brexit -- but the future and functioning of the government is now also a threat for the pound," which lost more than 1.5 percent to get as low as $1.2507 -- the lowest level since April 2017. "This is yet another blow for companies desperate for clarity," said Carolyn Fairbairn, head of the Confederation of British Industry big business lobby as May insisted her deal "is the right one" while promising to seek "additional reassurance" from Brussels over a controversial provision on Northern Ireland. Earlier, the European Court of Justice had ruled that Britain was free to halt its withdrawal from the bloc unilaterally in response to a suit from a group of Scottish politicians. David Cheetham, chief market analyst at XTB UK, said a vote delay would only deepen uncertainty. "The move may have spared an embarrassing parliamentary defeat for the PM but it will no doubt see those calls for her to be replaced grow ever more vociferous," Cheetham said, adding that May's position was looking "increasingly untenable." Elsewhere Monday, oil prices slid on worries about sluggish demand after having surged ahead of the weekend as OPEC and other key crude producers including Russia agreed to cut output by 1.2 million barrels a day. "Oil's future rests on trade wars and weakening data, and whether either or both of these factors will start to ease in coming months, boosting demand expectations," noted Chris Beauchamp, chief market analyst at IG.